Rewire Appalachia is building a new training facility to bring even more former coal miners into the clean energy economy. In West Virginia, Coalfield Development Corp. trains coal miners in a new trade: installing solar panels. "Basically it's like, what's next?" said Luke Huffman, property manager for Coalfield Development's new training facility. 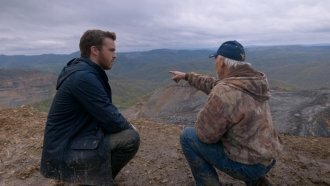 "Coal is running to an end here where we're just starting to take the top of mountains, and we're starting to just tear them down. So we've got to find renewable energy. I want the best thing in the world for all the coal miners, but what happens to them when the coal runs out? We've got to make sure they're trained. And solar work out perfect, is the way we look at it." Coal has dominated the region's economy for a century. But the booming solar industry now employs even more Americans than coal. And it's making gains, even in coal country. "It's just the cold hard truth that we have to move from coal to something else, not move completely away from it," Huffman said. "We can work side by side with coal the whole time. But we have to make sure that everyone's trained and everyone understands that it's here and it's the next step." Once this new training facility is built, Rewire Appalachia said it hopes to expand its program across the region.